"My friends recommend RipIt4Me to me a lot recently. They said that it is the best DVD ripper for Mac they have met so far. As a Mac user, I want to install this program on my Mac, but, there is a question: is this RipIt4Me suitable for Mac or not?" RipIt4Me is really the fantastic DVD ripping software to break many encryption protections like ARccOS, RipGuard DVD techniques, etc and backup them to your PC, that is to say, windows OS X is supported very well. This powerful ripper is very convenient to use-"1-Click Mode" will make the ripping procedure become simple including inserting a disc, browsing the destination folder and starting ripping. Furthermore, the latest update about automatically detecting whether DVD is encrypted or not will be showed in the main interface. Undoubtedly，it is a remarkable and powerful ripping tool among thousands of free DVD ripper software. But, as we have mentioned before, it is applicable for Windows users rather than Mac users. There are lots of people adopting Mac OS X in this rapidly developing digital era, and for them, taking time to figure out RipIt4Me alternative is the right choice instead of finding RipIt4Me for Mac. Because it is not existed in the market or haven't been developed until now. Designed specifically for Mac users, MacX DVD Ripper Mac Free Edition is all-in-one free dvd ripper for Mac to backup and rip DVD movies (including commercial DVDs, e.g., CSS encryption, Sony ARccOS, Disney movies copy protection, region protection, UOPs, APS.) for freely playback on Mac OS X or on iTunes and Apple TV as MOV, MP4 and M4V formats. Moreover, this RipIt4Me for Mac Alternative allows you to transfer ripped DVDs to digital media device like iPhone. Before ripping, you should make sure that you have downloaded MacX DVD Ripper Mac Free Edition and installed it on your Mac. Then, follow the below steps. Launch alternative to RipIt4Me for Mac and load DVD content by clicking "DVD Disc" after insert your DVD to hard drive. 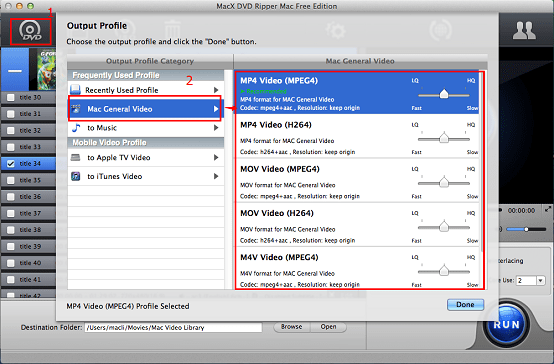 Choose the output format in the pop-out output profile dialog box like DVD to iTunes, DVD to MP4, DVD to MP3, etc. With the help of RipIt4Me alternative, you can watch any latest DVDs on the move. Specify output folder on your computer to save the output profile by clicking "Browse". Hit "RUN" button to start ripping DVD with free DVD ripper software Mac. You can view the whole ripping process or stop it at anytime. Then you can transfer the converted DVD movies to iPhone iPad using MacX MediaTrans. It is the best iPhone data transfer software that can sync music between mac and iPhone iPad iPod, backup iPhone photos, export 4K videos from iPhone (7), iPad Pro to free up space with ease. In addition, the fast ripping speed of RipIt4Me for Mac alternative will short the whole process a lot due to the multi-core design and hyper threading technology. At the same time, it will output the excellent image and sound quality video. And for those advanced Mac users who want to get more output formats like AVI, MPEG, FLV or rip DVD to Apple, Android mobile/Pad, Microsoft and Sony Devices, MacX DVD Ripper Pro is the prior choice for you, which is also capable of 1:1 copying DVD to a single MPEG2 file with original audio and video quality. Are you seeking for a RipIt alternative Mac? Never mind, this tutorial will show you an alternative to RipIt running on Mac (El Capitan & macOS Sierra), helping you easily rip DVD to iPhone, iPad compatible format on Mac, even Mac OS X 10.11/12.